i am wondering if there are any 2012 or even 2011 55 or 7 inch models that have the voice command and have traffic alerts without a route set???? I gave up on Garmin's traffic long ago so I can't help there. Regarding screen size though, the first Garmin model with a 7" screen was the Dezl 760 which was introduced in 2012. Aside from that, you will need a 2013 model if you want a 7" screen. There are plenty of models with 5" screens however, going back a number of years. I have a 2595 with GTM60. It does ring a ding sound when you are approaching a congestion, followed by a banner indicating the conditions of of the congestion. When you enter the perceived congestion zone, the road color is augmented by color broken line segments, yellow for moderate and red for severe and some icons for accidents, construction etc. I believe the same indicators exist in all the recent-model Advanced and Prestige Series. And of course, on the models with route capability, you need to program the route only once and recall it every time you would like to travel the same route. Some models, like you 3597, have the "My Trend" feature. It learns your travel pattern and will offer you the most-traveled routes that you use at particular times of the day without your input. It is quite annoying at times. I am not sure if it works with pre-programmed routes. You might have various options that could suit your needs. I believe the same indicators exist in all the recent-model Advanced and Prestige Series..
Well the OP has one of the prestige models and it evidently won't do what he wants. He wants traffic warnings when no route is active. The part I don't understand is that he wants a warning of "an accident up ahead". How would the GPS know whether an accident is "ahead" or "behind" if you aren't travelling a route? Well, I would assume he wants traffic for the road he is currently on. Displayed for a 'reasonable' distance. I have a 2595 unit and when there is no route, I get traffic for the next 10 miles or so on the road I am on, which can be annoying itself since I only go about 6 miles before I turn off. These devices receive traffic data for a consierable distance from your current location. 50 to 100 mile radius seems typical. (As long as you have something beter than the "free" Navteq serice.) That's the case for my Garmin 255W, my old Delphi, and (until we cancelled the subscription) the built-in GPS in my wife's car. The built-in GPS always showed color codes for traffic conditions, whether it or not it was navigating a route. I rarely used the other two without being on a route, but I suspect that you can switch the Garmin to the traffic screen rather than the normal screen even if not on a route. There wouldn't be a warning for something upcoming on the current undefined route, but you can glance at the GPS every now and then and look for red or yellow stripes. I just completed a 1700 mile trip which took me through Seattle, Salt Lake City and Phoenix. I'm not sure what your looking for as far as advanced traffic warnings but my 3797 poped up a traffic screen miles in advance of the potential problem. When the screen comes up it appears from the right hand side of the map screen. 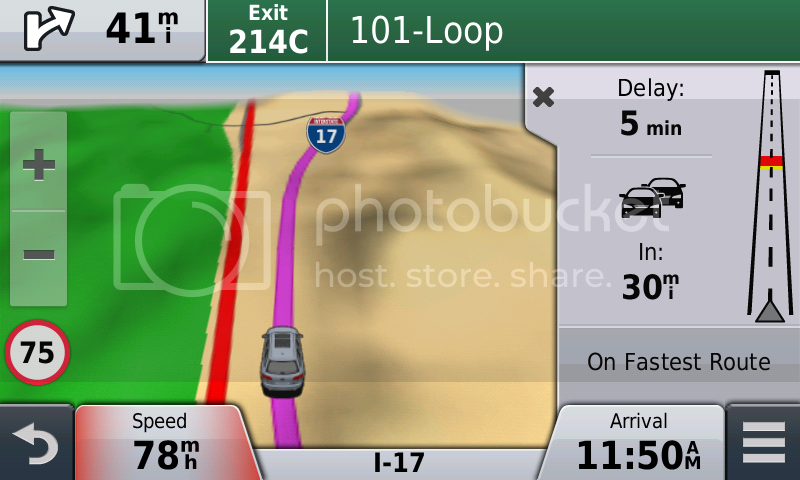 It displays a road with details of the delay (how far ahead and how long the delay is, etc.) and if there is alternative routes which would save you time it displays that information as well. In all cases, I had a route entered so I can't speak to whether this would work without a route but it would appear to be superior to the presentation of any of my Nuvi's, which includes the 760. One thing you may need to have done for these warnings to appear is to insure that you have selected the traffic to display. To do this, go to Settings - Map & Vehicle - Map Tools and SELECT Traffic from the list presented. Also select all the other items you like to see on the map screen. Then Save your suggestions. At this point the Traffic information should appear on the map screen when ever there is something to report. You can call it up at any time by having the traffic cable attached and powering the Nuvi and pressing the 3bar icon in the lower right corner of the map screen and selecting Traffic from the pop up screen. Note, you can have the traffic tab visible all the time or close it any time by pressing the X in the upper left corner of the tab. Costco has 2595LMTHD for $170 and a $10 rebate from Garmin. It comes with the GTM60, HD digital traffic. P.S. Just got a 3597LMTHD refurb at $250 from The GPS Store. I like it a lot, quite a bit more than the 2495LMTHD that I already have. It is a shame that the 3597 lacks the one critical feature you need.